You may think your food order is pretty much decided when you rock up at a McDonald’s drive-thru, but new dynamic menus to be installed by the restaurant chain may see you leaving with a few unexpected extras. The major change to the fast-food giant’s drive-thru experience is coming later this year and is the result of the company’s recent acquisition of Israel-based machine-learning startup Dynamic Yield for a reported $300 million. Dynamic Yield’s so-called “decision technology” will be built into new electronic menu boards located at McDonald’s drive-thrus to provide a more personalized customer experience. This means the items on the menu could change even as you order. So, as a simple example, if you order a burger, the menu could automatically respond by pushing fries front and center on the menu board, or other side items, which may persuade some customers to select extra snacks when they hadn’t planned to. The technology powering the menu boards will also take into account factors such as current weather conditions — so it might offer up cold drinks on a hot day — and also how busy the restaurant is, meaning if there’s a long line and the kitchen is under pressure, it might push items that are quicker to prepare. 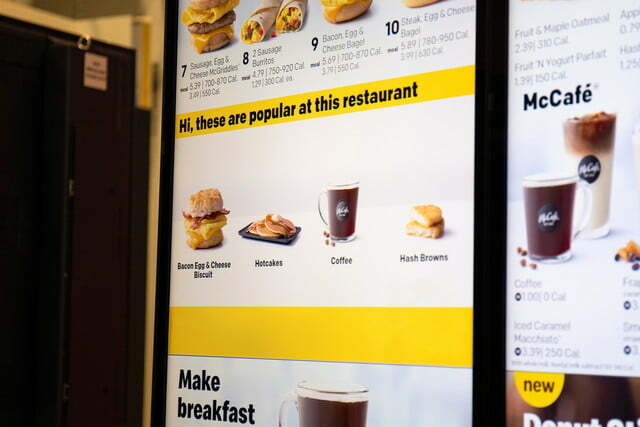 If you hadn’t already noticed, McDonald’s high-tech menu board is similar in many ways to how Amazon’s online shopping site constantly offers similar or complementary items as it tracks your search activity click by click. McDonald’s has been testing the technology at a number of its restaurants over the past year and is now preparing to roll it out at more than 1,000 locations within the next three months, according to Wired. The long-term plan is to install the smart menu boards at all 14,000 of its U.S. restaurants, as well as at its international locations. It’s likely the technology will eventually find its way into McDonald’s self-order kiosks and mobile app, too. 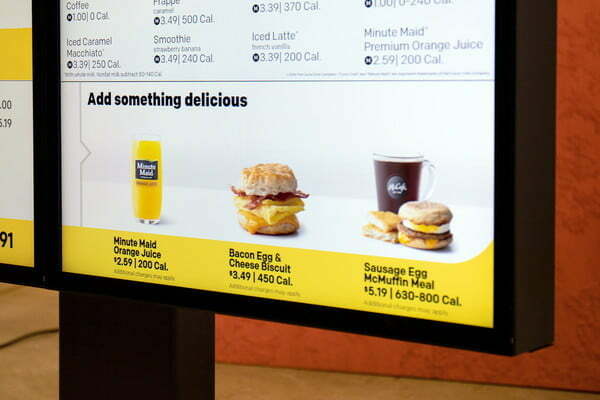 McDonald’s CEO Steve Easterbrook even suggested it could one day include license recognition technology so the menu board could adjust its items based on a customer’s recent purchases. In that case, customer data could be shared across the entire chain of restaurants rather than be confined to a single outlet, further enhancing the power of the technology and its ability to drive sales. The move by McDonald’s to embrace artificial intelligence in a bid to boost profits mirrors similar efforts by a growing number of customer-facing businesses in recent years. Combining the decision technology with customer data gathered via loyalty programs and apps enables these companies to offer a more personalized shopping experience — one designed to tempt you into making extra purchases almost without realizing it.